It seems like everyone is talking about detoxing. Whether it's detoxing their lives by getting rid of negativity, or detoxing their diets, “detox” is definitely one of the big words in health today. With all this focus on detoxing, I figured that I'd talk to you guys about one of our body's natural detoxifying systems, the Lymphatic System. The Lymphatic System is part of the immune system, and has quite a few similarities to the circulatory system. It consists of vessels and nodes that run throughout your whole body, carrying fluids from tissues around the body to the blood and from the blood to the different tissues. It cleanses almost every tissue in the body by removing toxins, metabolic waste, and more. This system also moves white blood cells to tissues that need them, as well as generating and storing them, and balances the fluid levels of the whole body. Lymphatic Vessels carry lymphatic fluid (lymph) through the body using a series of valves that control and direct the flow of the lymph. This system works, very much, in the same way as the circulatory system, except it does not have a pump (the heart) so we need to manually move the lymph through movement, diet, and massage. Lymph Nodes are the lymphatic filtration system. They are found throughout the body (armpits, throat, chest, abdomen, groin, etc) and are generally found in groups, or chains, in fatty tissues close to veins and arteries. These Nodes are where the body fights infection causing substances, such as viruses or bacteria, as well as cancer cells. The Nodes house white blood cells, so when infection is forced into a Node, the blood cells are there to destroy it before it can cause further damage. Lymph Nodes tend to swell when you are ill, because more white blood cells are generated and sent to specific Nodes to fight off your infection. The Tonsils, Adenoids, Appendix, and Peyer's Patches are all lymphatic tissue charged with protecting the body from infection. Tonsils filter out bacteria before it hits your gut, helping to reduce the occurrence of food born illness. Adenoids do the same for your lungs. The Appendix and Peyer's Patches help filter out bacteria in the gut. The Spleen, Thymus, and Bone Marrow are where our bodies create and direct white blood cells. The Spleen and Thymus also filter dead blood cells and detect infections. What Are Some Signs that it's Not Healthy? Just like any bodily system, the Lymphatic system can become stressed, congested, and in some cases even blocked. When this happens we can see signs like fatigue, pain, and even reoccurring illness. Here are a few things to look out for. What Can You Do to Keep it Healthy? When you ignore the health of your Lymphatic System, your immunity suffers. So what can you do to keep it at optimal health? Actively Reduce Stress- Stress puts your whole body into a funk and releases hormones into your system that need to be filtered out. Reducing the output of those hormones will help your Lymphatic System be better able to filter all of those toxins out of your system. Check out some stress reducing tips to add to your daily routine. Deep Breathing- It's amazing how often we can forget to do the basic things in life. Deep breathing is one of those things that seems so simple, yet helps in so many ways. Not only does breathing deeply help us to reduce stress, it also acts as a pump for our lymph. Check out these three deep breathing exercises and try to incorporate them into your daily routine. You should see some great results in no time! Exercise and/or Mindful Movement- The most obvious way to move your lymphatic fluid is, simply, to move. Exercise plays a very important role in our health, and especially in the health of our Lymphatic System. Some great forms of exercise to help improve your Lymphatic System include rebounding and high-intensity interval training (HIT). Now you don't have to keep up the most vigorous of exercises in order to help move your lymph, something as simple as mindful movement can be enough. Yoga and Tai Chi both incorporate mindful movement into their exercises, but you do not have to practice either one in order to practice mindful movement. Mindful movement is moving with more intention and awareness. Check out these tips for adding mindful movement into your life. Perspiration- Sweating is one of the major ways our bodies rid themselves of waste. So it easily follows that perspiring more/more often can help with all of the detoxification systems, including the Lymphatic System. Not all exercise causes us to sweat and there are a number of people who cannot participate in those exercises that do cause perspiration, but that's ok because there are other ways to trigger sweating. Saunas and infrared saunas help to increase our perspiration as well as provide a non-invasive way to circulate toxins out of our organs and muscles, so that they can be released from our system through our pores. Be Mindful of What You Put On Your Skin- The Lymphatic System often releases toxins from the skin when it becomes sluggish. This release is often blocked when we wear synthetic fibers (nylon, polyester, etc) or when we apply chemical-laden creams or soaps. Most of the toxins that were supposed to be released, are then re-absorbed along with additional toxins from whatever we have applied to our skin. This is why it's so important to wear natural fibers and only apply natural, organic creams and soaps. The basic rule of thumb, in regards to skin care products, is that if you can't eat it, don't apply it. There are a few examples (essential oils and some herbal products) but this is a great rule to follow when looking for your next product, and don't forget about laundry products and deodorant. A special note for the ladies out there: Tight fitting bras and underwires impede normal lymph flow as well. Make sure your bras fit properly, avoid underwires, and go braless whenever you can. Don't forget that our breast tissue is made up of both mammary glands and lymphatic tissue. Take care of your ta-tas and they will take care of you. Diet- Diet is a key factor in a number of health related issues. I'm sure that what I list here is going to come as no major surprise, but keep an open mind about just how much you see these same tips and think about how much your life may be impacted by poor dietary choices. Stay Hydrated- Water water everywhere. Hydration is super important for any and every bodily function. Drinking water throughout the day is one of the best ways to stay healthy, especially when you're talking about the health of the Lymphatic System. Lymph is composed of a large amount of water and helps to keep the balance of the water in the body's tissues. Keeping hydrated is key to helping keep that balance. If you're not sure where to start, try this technique for a simply lymphatic cleanse using water. Herbs and Essential Oils- There are quite a number of herbs that help keep the Lymphatic System healthy. Taking them as daily supplements, teas, or diffusing their essential oils can be great ways to boost your lymphatic health. Essential oils such as grapefruit, lemon, orange, bay laurel, clove, rosemary, peppermint, ginger root, and oregano are great to diffuse as well as to add to a bit of massage oil for self massage. Cleavers (Galium aparine) is a great herb to help enhance the function of the Lymphatic System. It improves the body's ability to flush out toxins, decreases lymphatic congestion, and reduces inflammation. Burdock (Arctium lappa) is a multi-system detoxifier. It supports the liver, kidneys, digestion, and lymphatic systems as well as purifying the blood and lymph. Purple Coneflower (Echinacea augustifolia) has gained quite the well deserved reputation for being a great immune herb. However when you combine it with Astragalus, it also has the added benefit of reducing swelling and congestion in the lymphatic system. Astragalus (Astragalus membranaceus) on it's own is a great, over-all, health booster. However, when combined with Echinacea, it's a great way to reduce swelling and congestion in the lymphatic system. Licorice (Glycyrrhiza glabra) is one of the most gentile and effective detoxifying herbs known. It's said to remove over 1,000 known toxins from the body. Massage, Chiropractic, and Acupuncture- Alternative therapies can help to increase the health of all your bodily systems. 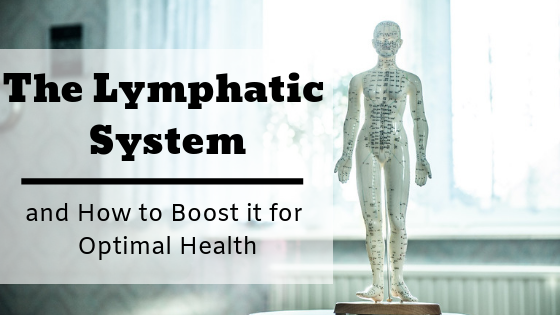 The Lymphatic System is no exception. Lymphatic massage is especially helpful because it's designed, specifically, to get your lymph flowing. But chiropractic and acupuncture can help get things moving as well. Ask your practitioner today! Dry Brushing- This is one of my favorite ways to move lymphatic fluid in the morning. Seriously. I dry brush every day when I get up in the morning. Generally right before my shower (dry brushing also exfoliates the skin so washing off all the dead skin left over is a major plus). If you've never heard of the technique before, here's a great introduction to what dry brushing is, and how to do it! I hope this has encouraged you to be more mindful of your Lymphatic System. Please seek out other tips and feel free to share. Do you have any questions or comments? Post them below!